This gorgeous gold and turquoise bangle from Ippolita retails for $1895 at Neiman Marcus. Bellissimo Jewelry on Etsy has a similar bracelet which retails for a more affordable $38.50. Click HERE to view the item, and HERE to go to the Etsy store. *Update - 8/30/11* - I'm a huge fan of the Etsy store NYLightMetals and Regina also has a fantastic alternative to the Ippolita bangle. 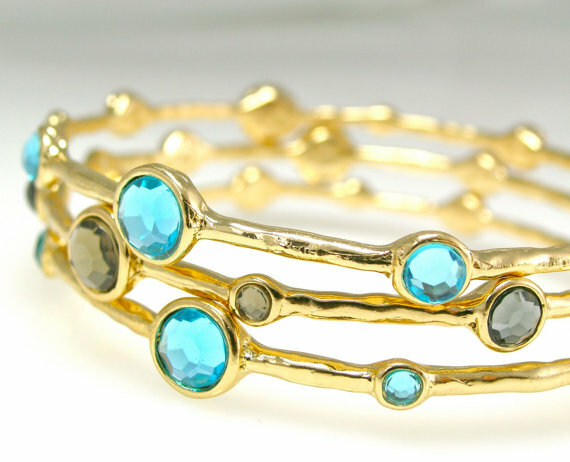 You can get a set of THREE hammered sky blue and smokey grey bangles on sale for $42 right now (normally $48). 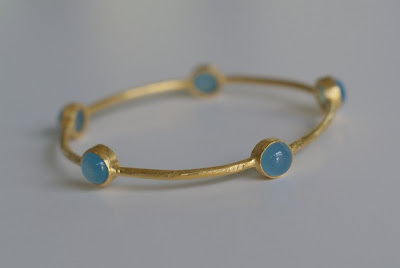 Click HERE to purchase these gorgeous bangles or HERE to visit her Etsy site.